What is it about summer that makes us want to watch thrillers? The newest summer scare-fest success is Drag Me to Hell. A few years ago I attended an outdoor screening of The Birds in Bryant Park. It totally eerie to watch such a movie outside, where pigeons roam free–not that, as the movie suggests, man-made walls protect us from the wrath of flying monsters–and it was a totally satisfying jump start to my summer. I guess it goes along with the compulsion to make those summer reading lists. Plain and simple, summer is worth celebrating. We made it. We get to pack away our winter coats and go to the beach; we get work less, or we pretend we do. No matter what, life is easier when outdoor movies are playing and open spaces beckon us with green grass and shining weather. Me, I’ve been spending the week in Northern California with relatives. Earlier this week I visited Monterey Bay, Pacific Grove, Carmel-by-the-Sea, and the town of Tracy. It was here I saw my first thriller of the summer, projected outdoors on 35mm (personally, by my uncle and self-professed AV-lover) onto a screen set up in the backyard. Clearly, in craft it’s no Million Dollar Baby. (There’s a scene where a microphone hangs in the corner of the shot for at least 30 seconds before it is quickly pulled out of sight). 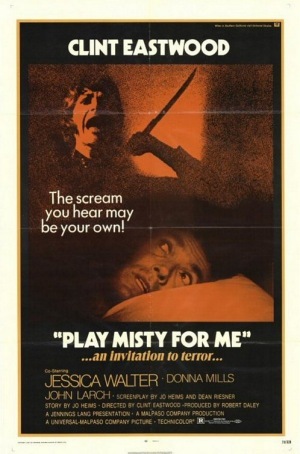 But where Baby‘s hyper-hygienic flawlessness threatens asphyxiation, Play Misty for Me is way more fun. (For the record, I found the charming “unsubtle subtleness” of Sideways of the same movie year much preferable to the overwhelming heaviness of Eastwood’s work.) I can’t imagine enjoying the Pain and Emotion of Frankie Dunn administering that last shot of adrenaline over strawberry pie and whipped cream in the ebbing heat of the Central Valley. Eee, no way.